KRK ROKIT RP5 G3; the third generation of KRK’s elebrated active studio monitors – seen here in sleek black, ready to fit into any studi..
KRK ROKIT RP5 G3; the third generation of KRK’s elebrated active studio monitors – seen here in sleek black, ready to fit into any studio set up. The KRK Rokit Powered monitor offers incredible sound via a 1” soft dome tweeter and a 5” glass-Aramid composite woofer. A ROKIT waveguide is used which is designed to ensure incredibly detailed image when in the listening position while a front-firing bass port reduces boundary coupling, thus allowing more options for positioning the Rokit RP5 in the room. A wide range of input connections mean the ROKIK 5 G3 easily integrates with your existing system setup while a proprietary bi-amped, class A/B amplifier delivers SPL up to 106dB, a lot of head room and low distortion. 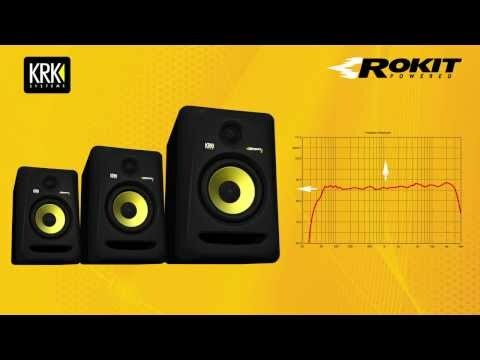 The KRK ROKIT 5 G3, Rokit Powered studio monitor is the perfect, compact solution for small studios requiring big sound.